Kale soup with curried cauliflower rice is one flavorful healthy soup recipe to keep you warm this season. 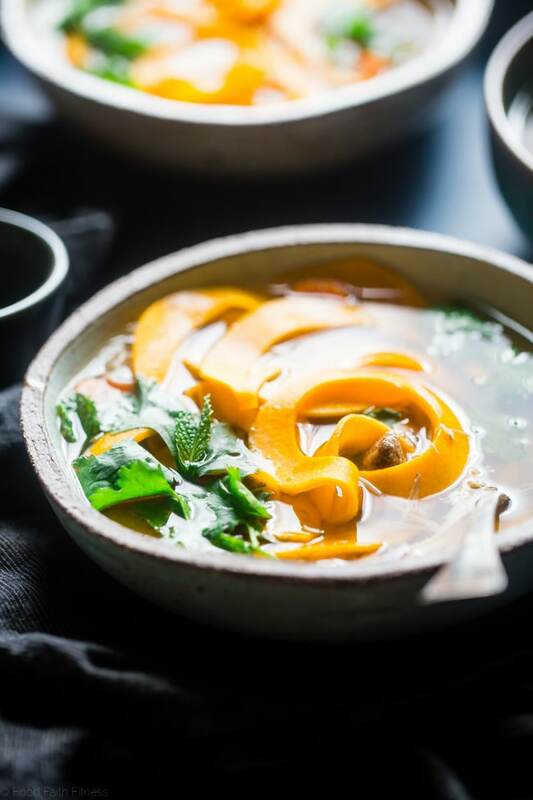 An easy vegan, Whole30-friendly, paleo soup recipe for a nutritious meal-in-a-bowl. Roasted curried cauliflower rice with kale and even more veggies to fill your bowl! 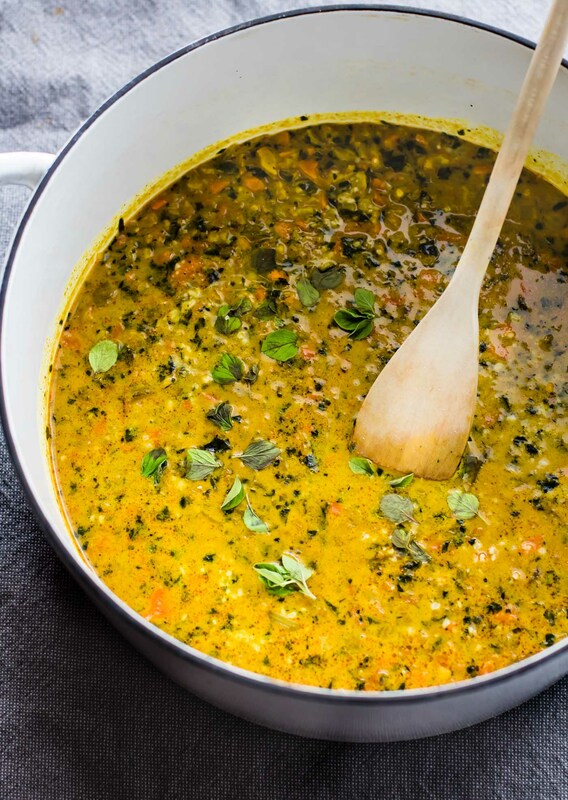 You’ll want to make this delicious vegetarian kale soup recipe again and again! Soups on y’all! I feel like Friday’s, during colder months, should be soup days (PHO Sure!). 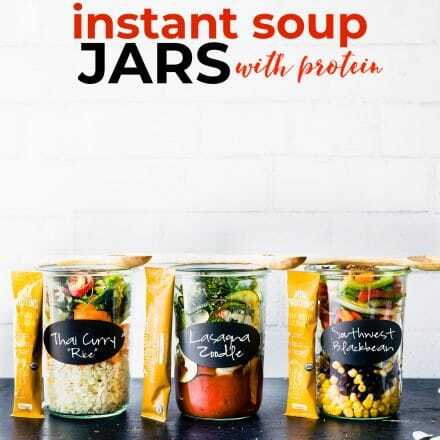 Or healthy soup days in general so that you can make a big batch and enjoy all weekend, right? 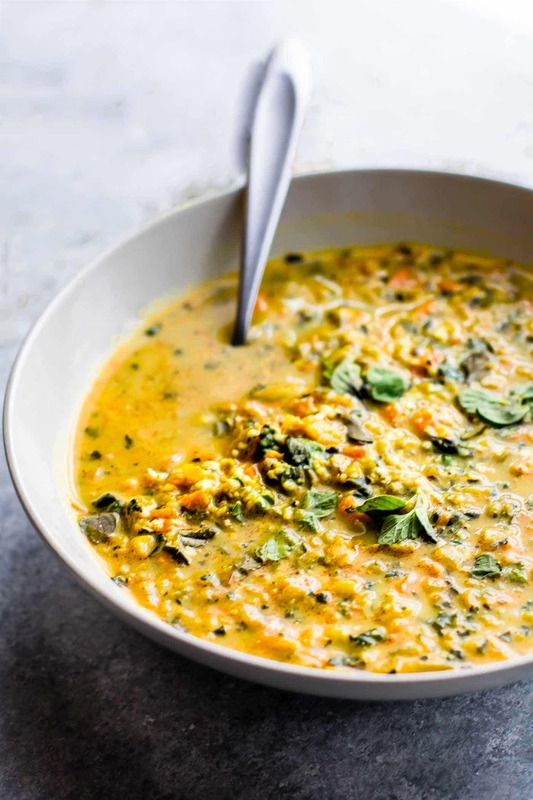 Like for instance… Curried cauliflower rice kale soup. It’s better than Campbell’s mmm mmm good. LOL! Today this Corny Cotter is teaming up with some pretty FABULOUS blogger babes! 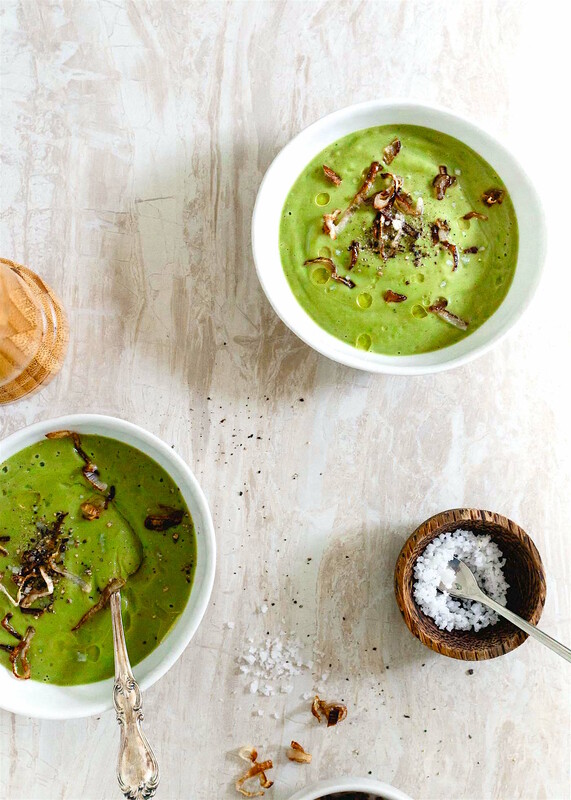 We’re bringing you a roundup of tasty healthy soups to make this season! 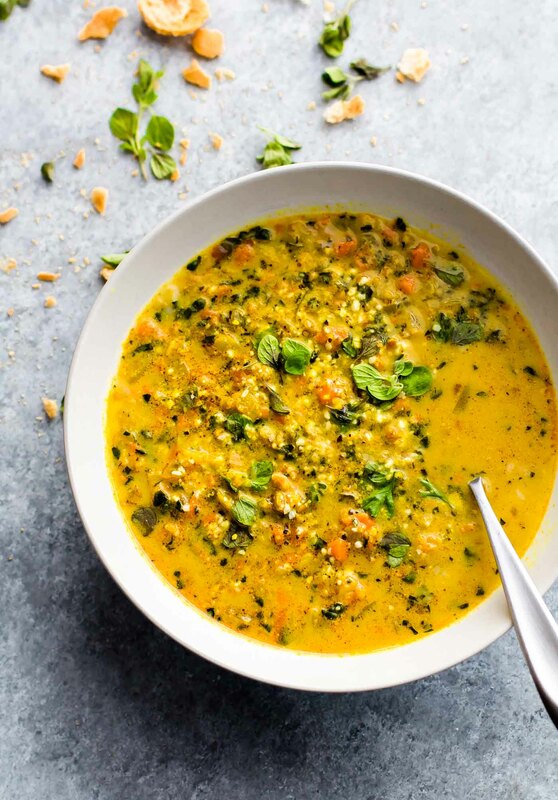 I’ll get started by sharing a little how to video all these AMAZING soups, and then we can jump to my curried cauliflower rice kale soup at then end. Sound good? Let’s face it, we started the week off right with a healthy Italian Sweet Potato spaghetti bowl, might as well end it the same way. 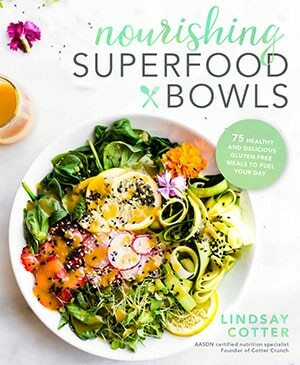 Snappy, healthy, bowls of goodness! You know, to even out the chocolate caramel goodness in the middle. That’s my logic. YUM! This crock pot chicken noodle soup has a Thai spin! It uses butternut squash noodles to keep it gluten free, paleo friendly and under 300 calories and 3 SmartPoints! A low-carb option is included! 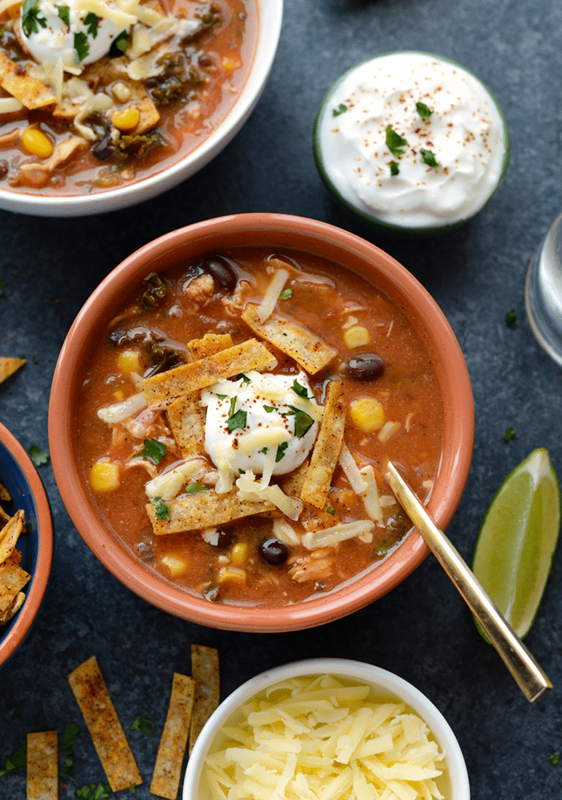 Crock-Pot Chicken Tortilla Soup with Kale from Lee at Fit Foodie Finds! Green Chile Vegetable Soup from Lexi at Lexi’s Clean Kitchen! This Green Chile Vegetable Soup is light, flavorful, and packed with hearty veggies! It’s the perfect meatless soup to keep you warm all season long! 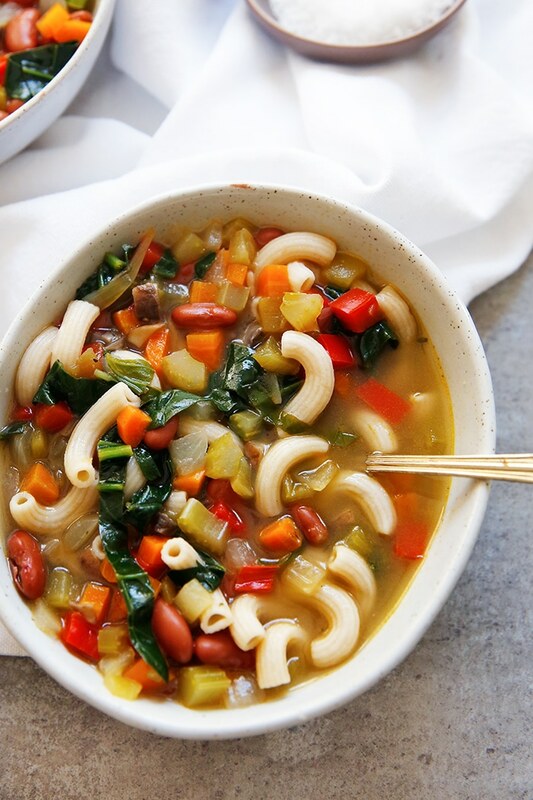 Customize this soup with your favorite veggies, beans, and/or gluten-free pasta, too! P.S She has a new COOKBOOK out you can pre order! OK really it’s one of my favorite healthy vegan soup recipes. All that curry and turmeric, it’s like a little spice of heaven. I mean slice of heaven. And don’t worry. , You won’t turn yellow. Although you may have a “golden” from all that wonderful nourishment. Ha ha see what I did there? The great thing about this cauliflower and kale soup recipe is that you don’t even have to make real rice. Nope, it’s that easy! We’re making cauliflower rice instead. 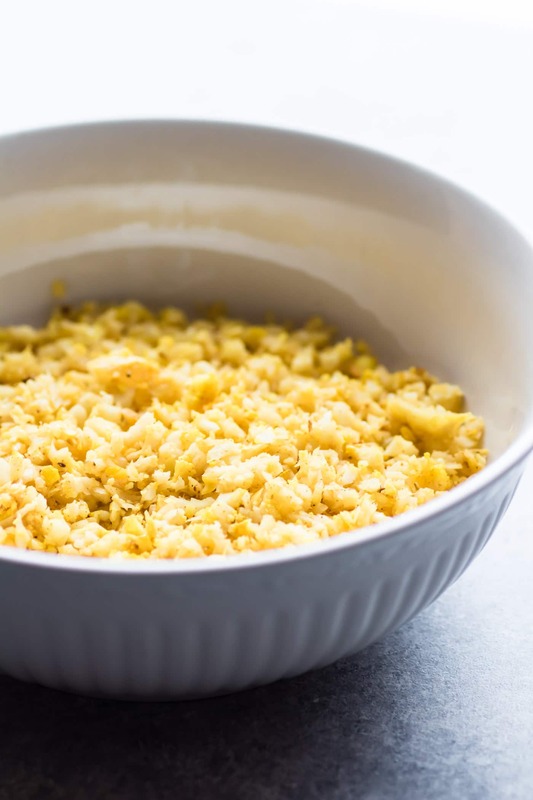 Roasted curried cauliflower rice. And it literally takes about 20 minutes to make the “rice,” then you throw it in the soup along with all the rest ingredients. Those POWER nutrient ingredients like kale, CURRY, and broth. I would call this is a “detox” soup, but I don’t want you to think that eating my brownies mid week is a bad thing. Nope, it’s all about the dark chocolate superfood. And a little bit of balance. Yes yes, I know detoxes, turmeric, and curry are all the rage right now, but it’s probably a good thing. Maybe we take advantage of this trend? It does wonders for the body, well natural detoxes that is. It just means we PACK more antioxidants, anti-inflammatory foods, and nutrients into our diet. Ya, I like that trend. Soothing to body and the soul. Trend setting aside, a simple, healthy soup recipe is a great staple to have around. 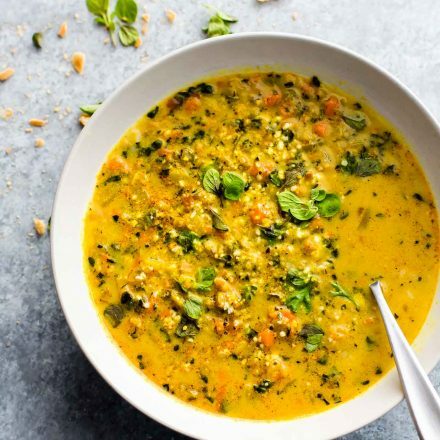 This curried cauliflower rice kale soup is a crowd pleaser for everyone. It’s Paleo, and vegan, and dairy free, and gluten-free, and all those dietary labels. But in all honestly, when it comes down to it, this soup is just a healthy recipe packed with real food. Big bold and hearty flavors and yet still healthy. So if you have 45-50 minutes and a refrigerator full of veggies, that’s basically all you need. Oh and curry spices. Crucial. Let’s get to this oh so delicious roasted curried cauliflower kale soup recipe. How do you prepare kale for soup? If you’re using Tuscan kale, you just need to make sure to remove the large rib from the center of the leaves. 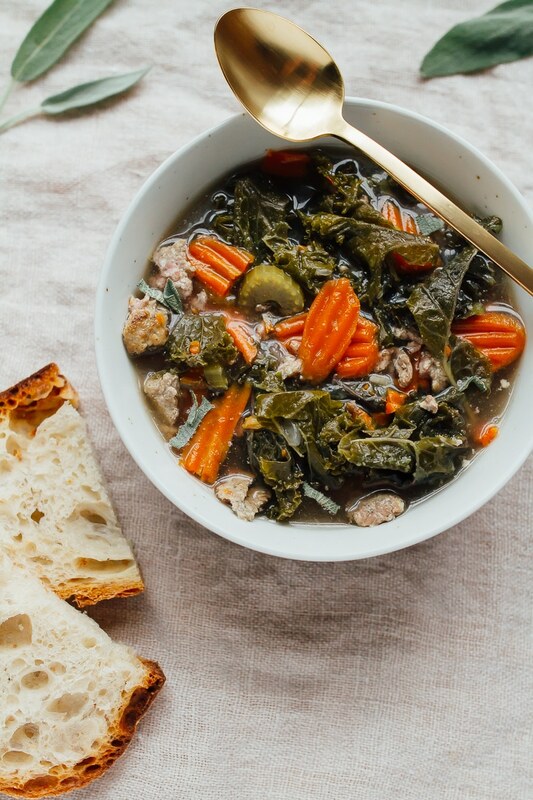 Baby kale also works really well in this kale soup recipe. PS. You can totally freeze this and use it for later. Another perk for a veggie packed soup. Alright friends, I think you’re pretty stocked up on soup ideas now, right? Stay warm and ‘yer SOUP ON! What’s your go to healthy soup recipe? Have your ever tried curried cauliflower or cauliflower rice in a soup? p.s I know what you’re thinking, it’s Friday, I don’t want to cook. No PROB, JUST PIN THIS RECIPE for later. That’s what I call Meal Prep Perfection! Cool? I’ve put cauliflower rice in a lot of things but never soup. I must try! oh girl, you will loooooooooove! Making this now! Did you add cumin or tumeric to the water? How’d you get the yellow colour? I added turmeric and curry which makes it really yellow. Hope that helps! How is this 20 carbs per serving! Gasp!!! Looks amazing! This is the best soup I have ever made. Thank you sooooo much for the recipe!! Also, I couldn’t even finish one serving, made it into 8 servings instead of 4, it’s so filling!! Woohoo so glad you liked it Jonica. Love the cauliflower hack! It sounds lovely and so much texture from ALL the veggies! Add some roasted chickpeas and we can PUMP up that texture, right? thought of you. Chickpea lovers unite! I’m just now hitting soup ready. I can’t wait to dig into these! So many tasty soups! I’ve been loving soup already–I always get a hankering for it once it starts getting chilly and considering it was in the 30s when I woke up this morning–well yeah, MORE SOUP PLEASE. I LOVEEEEEE curry and cauliflower together….but cauli RICE?! This is bombbbbbbbbbbbbbbbbbb! I wish we were eating it together!! for sure. I need all the immunity boost i can get. haha! I’m tired. can you relate? You and I are definitely on the same wavelength this month. It’s all about that Fall goodness. It’s the beauty of getting in some hibernation. Speaking of which, I have nothing on the agenda today, outside of taking care of the little one, and I’m going to enjoy the nothingness of it all. P.S. I can’t get on the golden train even though I want to. It interacts with my anti-depressant for the postpartum. I will save this though so I can make it when I’m off the meds. I’m just going to crank up the A/C and make soup anyway. I love crockpot chili, and I want o try this out too! what? let’s just hop back on a plane to Italy. It’s cooler there and we have plenty of soups to try. Mmmm k? p.s. how are you not jet lagged? 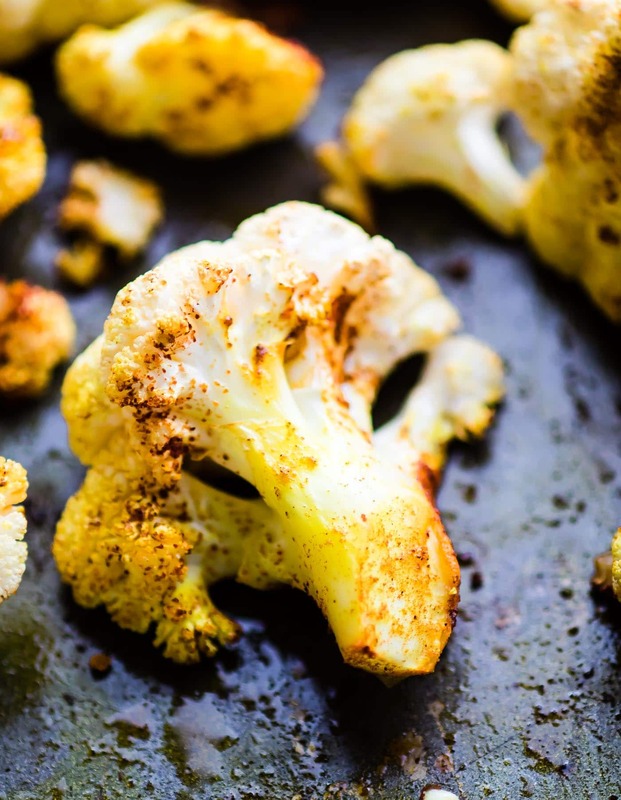 Yum I love cauliflower and this recipe looks absolutely delicious! let me know if you do Brooklyn! so thought of you! add lamb and it’s MAGICAL!! I love having you as part of our little group! 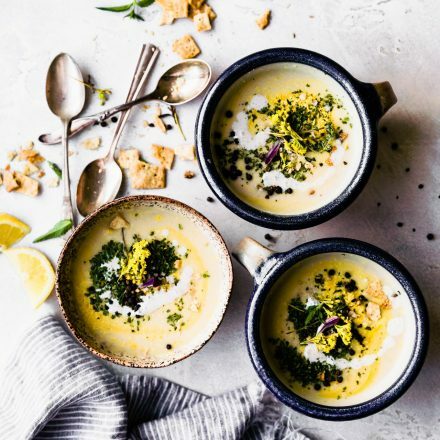 This cauliflower soup sounds and looks AMAZING! CANNOT wait to try this one. The curry, the kale, cauliflower RICE… sounds amazing! let me know if you do Laurel! Ooooooooh, this looks so comforting and delicious! Definitely the ultimate fall recipe! Soup is my favorite 🙂 I love the idea of using cauliflower rice in soup. Delicious and light. I made this a few days ago and loved the texture. Next time though I’ll omit the hot pepper flakes. Thanks for the recipe. Thanks for the feedback Beth. Was it too spicy? The pepper flakes made it too hot (not so much that we couldn’t eat it). And it’s definitely in my recipe binder and will be made often. I love veggie soups! I didn’t use the pepper flakes and even without it’s super spicy. Definitely can use a nice warm bowl of soup here. LOVE this! Cauliflower is super versatile. Also like the paleo option. I so agree! let me know if you try it! I just made this and had 1 bowl…then 2 small scoops. This soup is SERIOUSLY so delicious, Lindsay. Love it! oh yay! I’m so glad jen! It’s one of my fav too! for sure! keep me posted! I just made this for dinner-in date night last night! I think I added too many red pepper flakes, so it got way too spicy super quick. I remedied by adding another can of light coconut milk. I also didn’t finely chop the veggies since my blood sugar was low and I was dying to eat (Type 1 Diabetic!) so I threw about half the veggies in the blender after simmering and put them back in. For an added protein punch, I put about 2 shredded chicken breasts in as well. YUM. OH i like the way you think!! totally trying that next. Thanks friend! Just made this soup and it was amazing!!! I did add spinach because that is what I had, but this was perfect!!! Thank You so much!!! I”m so glad!! love the spinach addition! How was the soup after adding spinach? let me know if you like it Edgar! We love cauliflower, hehe! The garlic’s flavor was too good! so glad to here Edgar! thanks for reporting back. This sounds yummy – I’m going to give it a try. 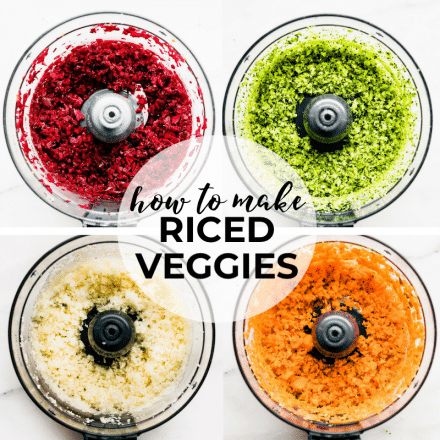 I am a huge fan of cauliflower rice but hate the mess it makes when I grate it (don’t have a food processor). I buy the frozen riced cauliflower in a steam-in-bag at my grocery store. Do you think I could use it instead? Would I need to roast it or is that step to just soften the cauliflower (i.e. no browning)? I’ve actually done that before too! I bought pre riced cauliflower. Drained water, roasted on a baking sheet with the spices before putting it in the soup. So it totally works! Let me know if you try it! Finally tried it – worked out real well. Very tasty! Thanks for the recipe! How much of the store-bought cauliflower rice did you use? Would love to try this shortcut! This soup looks incredible! I just bought some cauliflower too! I can’t wait to make it! Thanks! awesome! let me know if you try it. This soup sounds amazing!! anyway you can use the premade cauliflower rice..i don’t have a food processor? totally! I’ve done that before as well. Trying this tonight!!! Any fav veggie add-ins now that a few have tried it? I was thinking chick peas and carrots? But would LUV some suggestions! Oh you should roast the chickpeas the the cauliflower! Then add them to the soup later. YUM! Carrots would work too. Or even beets. Keep me posted! Very colorful 🙂 I always used to have variety of soups, this will be added to my list from this day! no, probably the carrots and sometimes kale can add some. I would switch out carrots if you’d like. No prob! This recipe looks amazing! I’m really new to cooking and therefore really need to follow a recipe step by step. How would you recommend I adapt this recipe to make in the crockpot? Also would you recommend adding tofu? I think the crock pot would be great but super fast! maybe low for 1 hr to 90 minutes. Let me know if you try it. Tempeh or tofu would be great too. I tried the cauliflower rice curry soup and it was fantastic. I did make a few adjustments as It was my first time trying my hand at anything involving curry. I only used 2 tbsp of curry. a whole can of coconut milk, then added a few splashes of red boat fish sauce and coconut aminos as I am doing the whole30 challenge. I added some shrimp in the very end for added protein. It turned out incredibly flavorful! Thank you for the idea. Will definitely make again! that sounds wonderful!! i will for sure be trying that next. I don’t see any tumeric in the recipe. Am I missing something? Hi Lynn! You can add more turmeric if you would like, but I used it in the curry powder/seasoning. It’s combined. Sorry I didn’t specify. Love curry, can’t have enough of it! What a clean and delicious soup this is! On my to-try list! thanks for sharing! me too! Let me know if you try it Savita! sure, I don’t see why not. Flavor might not be as strong when thawed, so add in more spice when you reheat. Does that make sense? 1) Instead of mixing the cauliflower in a bowl, I threw the cauliflower, spice mixture, and oil into a big ziploc bag and shook, shook, shook. and…. 2) I added a bit of salt. Wonderful! Thanks for letting me know about the changes! YUM! So hungry for this right now! Hey, Lindsay! I’ve been eying this soup for like, ever. I finally made it tonight. LOVED it!! So so good. I love anything cauliflower and anything curry and anything soup, so this was like heaven in a bowl for me. Definitely will be on heavy rotation here! Oh I am so glad friend! I love it too. Did you add anything else to it? I love hearing how other people made it. Nope, I didn’t add anything else. Made it exactly like the recipe. So so good! I made this and it was so delicious. I didn’t have almond milk so I used heavy cream and cut back a little on the carrots to make it more keto friendly it was so delicious that I had a hard time to control myself not to eat the whole pot. I think the roasted cauliflower is what makes it so delicious. Thanks for the recipe . Oh yay! Great idea with the cream. Love the extra richness Nancy! So, this is on my stove top as i type and my hub is getting hangry! Seriously tho, my mother in law is battling some kind of lung disease with tests galore coming up, anyway, she really is much more of a holistic person so I’m making a batch for her. Healing is also mindset, if anything. Thanks so much for this recipe! And I hope your mother in law heals soon. Sending love and prayers. I don’t have a food processor but Trader Joe’s sells riced cauliflower.. how would the recipe change in this case? Would you simply season it? Totally! I would roast it a bit with seasoning too. I’ve done that before. I’ll update the recipe notes. Just made this with bagged riced cauliflower. I didn’t roast it and I’m sure that would amp up the flavor. It’s still tasty and next time, I need to chop the kale into smaller pieces. Thanks for the recipe. Thanks for your feedback Deb! Yes, roasting it helps a lot but you can certainly skip that step in a hurry. Glad you liked it either way. I added 3 cubed potatoes, a can of of chickpeas, and a can of chopped whole tomatoes. I really loved this recipe. Often recipes are under-spiced but this was not. Thank you. I will definitely make this soup again! I added 3 TBSP of slivered almonds and 1/4c of freshly squeezed lemon juice. So good! Oh yum! Great idea Joanna! I think my new favorite color might be yellow. I mean Gold! Cause golden food makes you “glow.” Right? Yes! 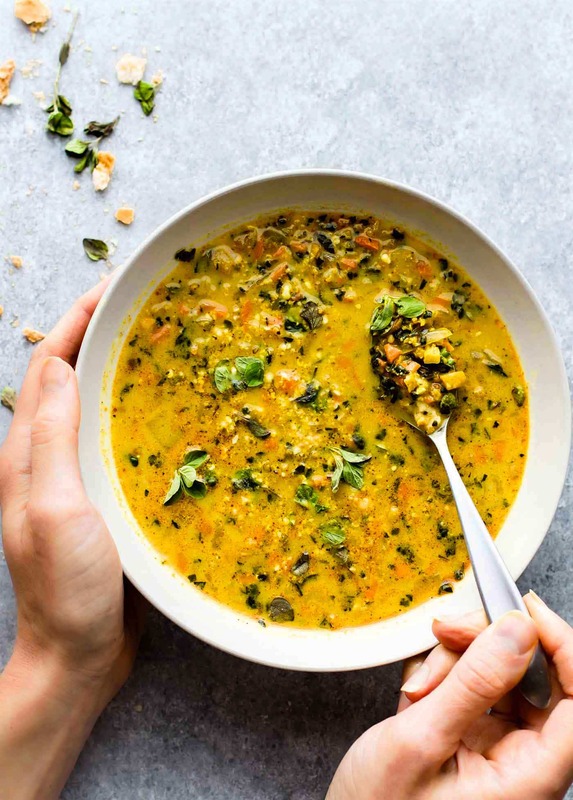 This Curried Cauliflower Rice kale Soup is one POT OF GOLD! See what I did there? Seriously y’all! An easy paleo soup recipe for a nutritious meal-in-a-bowl. Bowl recipes are my jam! Vegan and Whole30 friendly! Yeeeeehaw! Delicious! What a fun idea to add cauliflower rice to a soup..brilliant! The roasted curried cauliflower alone will be a new staple in my house. I added some ground turkey to the soup (something about guys not believing soup is a meal?? )… This was the perfect New England winter meal. Thanks for a winning recipe! That’s such a great idea! I love the ground turkey! gonna try that. Thanks Margaret. This is what is awesome about Pinterest! 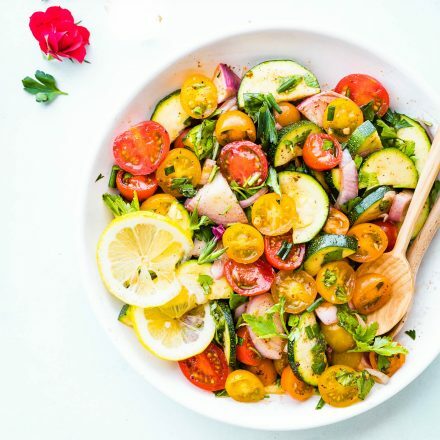 Just found this recipe and love it! I did go lazy and used frozen riced cauliflower (Trader Joe’s) and skipped the roasting. I cooked everything in my Instant Pot on soup setting. I did NOT use pressure cook mode and used glass lid. I feared the Almiond Milk might not stand under pressure. Anyway, I live it and I love spicey..so was perfect! Thank you for the recipe. Make this in the instant pot before I just forget to update the recipe with those notes. So thank you! How long did you cook? Mmmm… I haven’t tried this yet, but I just printed the recipe. I know I will love it. Looking forward to trying it! Wonderful! Keep me posted Joy! I made this today and it is delicious! I used a can of coconut milk to keep it Whole30 compliant. I also used more chicken stock (My 8 kale leaves seemed to be a whole lot in the pot) but I’m glad I did because the broth is Amazing! Wonderful! So glad. Love the coconut milk swap! What is that green little round erb on top? What are the dark grain looking things in the photo of the soup? It looks like wild rice, but I don’t see anything in the recipe that looks like what I’m seeing. I guess it could be the kale but just doesn’t look like it. Oh I think that was just some of the kale that didn’t get mixed all together. That or it might have been herbs. I threw a TON on for photo garnishing. Haha. My photo editing make it look like rice. LOL! Sorry about that. Happy to have tried this. Reheated well. Filling and felt very clean eating. Overall, I needed a different texture though. If I make again, might add some garlic “chips” or something else to the top that isn’t seeds. I love your additions, thank you! Thumbs up! This is still cooking, but it tastes delicious, and I’m having to “step away from the stove” to keep from drinking it right out of the pot. I love all things cauliflower, especially when curry flavors are involved, and I’m happy about the trend of stores selling frozen “cauliflower rice,” which makes it easy to indulge my cauli-passion. Add kale, and you’ve got a winner. Thanks for this wonderful recipe! This is one to put on repeat. Simply the best ! Toast some pepitas and squeeze a little lime on it , just for crunch and extra brightness! FIVE STARS !!!!!!! Just made this soup. I questioned it as I normally don’t care for califlower but once it was ready to eat I’m so glad I made it! Delicious! Loved the kale! Can’t wait to eat this everyday for lunch going forward! First time and I made a double batch! We loved it!! What are the nuts and herbs you recommend on top? I noticed that after we ate!! I was thinking papitas and some herb? What do you say? yay for double batch! I like to top with pepitas and a touch fresh oregano or marjoram to ease the curry spice. marjoram is synonymous with oregano, so both work. Hope this helps! I made this soup and loved it!! I used just a pinch of the pepper flakes, and I added about a teaspoon of ground coriander seeds… love that with curried cauliflower. I’m also a little heavy handed with the salt. It’s a great recipe, and I”ll definitely make it again. cardamom! not coriander… I always mix those names up! OH wonderful! Love the addition of cardamom seeds. I have to try that next alicia! I have a bag of rice cauliflower. Do I still have to place it in the oven to roast with spices or can I just put it all in a pot together and let it cook? I would to give it that nice roast flavor. Then just add to soup. Easy peasy! Absolutely love this recipe! Thank you for sharing. I added roasted chick peas and loved the addition. I just made this soup for lunch. I was looking for a healthy curried soup. This rocked!!! I loved everything about it. I didn’t have any carrots, so I substituted chopped up spiraled beets. I thought about using my canned coconut milk, but I went with your recipe and used cashew milk from my fridge. Thanks so much for posting this, I saved it in my favorites!! Oh yay! So glad! 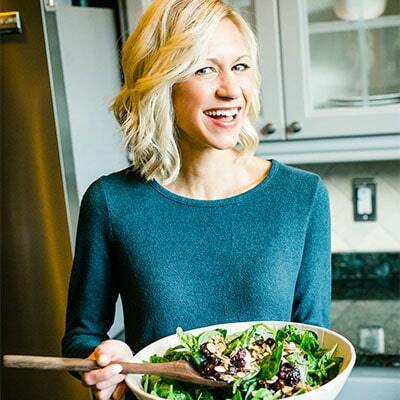 Love the idea of using leftover beets and the cashew milk Perfecto Lynette! okay okay now with all these comments saying how good this is i am definitely going to have to give this a try! Haven’t thought about cauliflower in my soup but think i will be trying this recipe this week. hopefully i can make mine look half as good as yours came out Lindsay! Thank you for the share! Yay! Go for it Kade! Has anyone done this on “Stew” function in an Instant Pot, or as a slow cooker recipe? I don’t have a stock pot but I’m dying to try this recipe. Small apartment with limited kitchen space, and we’ve managed without a stock pot so far! Actually! I had a reader do this is in IP! It was in the video posted on FB. I think he did pressure cook 10 minutes. Definitely your curried cauliflower rice kale soup paleo isawesomeness! This is a great recipe Lindsay, as you know I made it a short while ago and it was lovely, in fact have made it again since. Thanks for sharing! You brighten my day. oh yay! So glad you like it Bella! This soup is awesome! Oh my gosh, I’ve been looking for a soup that combines these flavors with cauliflower. It’s full of Kale which I’m not a fan of but it is perfect in this soup! Hi there! You can use spinach easy! Just maybe add an extra 1/2 c since it shrinks with cooking. I used simply organic spices curry but I know Trader Joe’s and Whole Foods has a good curry powder too! Lindsay, Thanks for the recipe. Delicious! Ok, I’m not vegan or paleo, but trying to eat healthy and loose weight and always looking for healthy snacks. The curried cauliflower. Right after roasting looks like a great side dish or snack in itself and I will be teying that soon!!! I added a half a cup of jasmine rice to this and it was great! Although, definitely didn’t need it 🙂 Put it in at the same time as the other veggies and just let the rice cook with everything else. Oh I loe that! Great addition and thank you so much for sharing your results with this soup Christina! Hi, I made this soup and am enjoying it. I have never had Kale in anything before, so didn’t know what to expect. But I found it was bitter in the soup. Did I use too much? Not cook it long enough? Or is that the nature of Kale? I might try using Spinach next time. And I love Parsnips, so might add them too. I eat soup all year long because I enjoy it so much and a recipe like this gives me lunches for work all week. Excited to try some of your others. Thanks for your recipes. Do you know what type of Kale you used? SOme are more bitter than others. Spinach totally works too though! I can’t find my last reply to you. But I don’t know what kind of kale it was. It was the only bunch in the store. I have just made it again and used spinach and it it awesome. I love that it is great cold too. It’s perfect. Will experiment with adding other veggies too. Thanks for an awesome recipe. I have this on the stove right now. Used spinach and added some parsnips with the other veggies. I snuck a taste and it’s great. Thanks again for this great recipe. Has anyone tried adding edamame to the soup? Would it work or is it too different? Oh nice! Yes, I think edamame could definitely work. The frozen kind? I found the soup bitter as well… Interesting info Lindsay, I didn’t know that about kale! Anyway, I had a serving when made it and wasn’t fond on the bitterness so froze the rest. Next time I ventured to eat some, I added cubes chicken breast and Frank’s Hot sauce. OH MY!! It was deliscious!!! I didn’t originally have the hot flakes so maybe that made a difference to the first go around? Regardless though, this is now one of my favorite soup recipes and freezes so well which is a bonus for sure!! Oh I’m glad it worked out Heather! Yes, the chili hot flakes help release the bitterness. But I’ve also found that certain kale is far more bitter! Genius move on the Frank’s Hot Sauce! Loved this recipe. Used a package of riced cauliflower and adjusted the baking time down a bit. Then added cooked ground chicken to the soup as it simmered. Delish! Just made this soup and it was amazing!!! I did add spinach to the recipe, but this was perfect!!! Thank You so much!!! I love the taste but did not receive the colour as you achieved. I tried adding more turmeric but the colour wasn’t that yellow. Will try it once again definitely! oh yay! glad you liked it. What curry powder did you use? sometimes certain curry powders have more orange or red color. My turmeric is very yellow though too. It’s from simply organic. Can you tell me how to achieve the colour of the soup? Excited to try some of your others. Thanks for your recipes. Lindsay, Delicious! I wonder, but a lot of calories? Definitely considering making this tonight! I unfortunately don’t own a food processor so I’m going to use my magic bullet. Also! It says it’s about 162 calories per serving, but exactly how much is the serving (measurement wise i.e. : 1cup…) would you say it is? I think the bullet will totally work! And i serving is around 1 1/2 c or so. Keep me posted! I’m so excited to try this! It might already be mentioned in the comments and I missed it, but about how many heads of cauliflower would be needed to get the 5-6 cups the recipe calls for? Not a bad soup base, but unfortunately (like many Paleo and Vegan recipes), this recipe needs a lot of flavour assistance. (Spice doesn’t necessarily mean flavour.) The cauliflower works well as a rice substitute. If you use coconut milk, I would use the thickest I could find for richness. Used half the chili flakes indicated and no black pepper which was plenty hot enough for anyone I know (again, spice doesn’t mean flavour). I added a little honey and then lemon juice to balance and layer up the flavour. Adding protein for texture and substance is a must. Also thickened it a bit with a 1/4 cup cornstarch (remove some broth, mix in the cornstarch, then add the mixture back into the soup to boil and thicken. And added 1/4 cup cilantro at the very end. Suggested changed to directions: Cook the onion/garlic as instructed, then add carrots to cook part way through for a couple minutes. (Otherwise, they will not get done as instructed.) Then add broth and simmer until carrots are cooked to desired doneness. Then add kale (which requires little cooking. Boil briefly until softened. Do not add milk until the end or it can curdle with boiling. I also added the cauliflower at the end to retain texture, as it can turn mushy if you boil it. Finally, add the honey (about one tablespoon) and lemon juice to taste, plus cilantro. Let the soup sit to macerate for an hour or so, which also helps increase the flavour. A very delicious and filling dish. I love the vibrant colors enjoying every spoonful in my mouth to stimulate the taste buds. I will definitely be sharing recipe and making more in future. Hubby said it was as good as the Indian Restaurant… trying to eat healthy and not eat out as much, and this did the trick. Thank you, I’ll be trying more of your recipes. Oh no! what kind of curry powder did you use Anna? is there anyway to use the slow cooker in the recipe ? sure! ALthough I still think you might have to roast the cauliflower before. For extra flavor. But maybe try it on low for 3 hours. I think I messed something up because it’s way to spicy and doesn’t taste like curry. My son tells me I need to add garam masala next time so I might try that and not baking the cauliflower , and measuring more carefully. Ooo yummy! Glad you liked it, Bree! Awesome! Thanks for the feedback LB! I’m not a kale lover. Do you think spinach would work as a good substitute? sure! you might need more though because spinach tends to shrink and cook faster. Hope that helps! Oh I am so glad! Thank you for your wonderful feedback Sonya! Merry CHristmas! Just want to know how was the taste of soup after adding spinach to it? Packed with flavor and delicious veggies. The curry and coconut milk combination are delicious! My husband was grumbling at me all evening after he gorged himself on this soup and was overstuffed. My fault for making something so delicious, so he said. I love how veggie packed this is. Very easy recipe. Me too! thanks for sharing Shataura! Delicious. My presentation was a little more chunky but it was super great and very filling. That’s good to hear, I’m so glad you liked it! Made this while I was sick and it made me stop needing my mother. Much appreciation to the intro comment about using whatever veg you may have in the fridge. I was missing the kale so I used an old sweet potato then spiced her up with some jalapeno. I’ve always been intimidated by curries so this was a great intro. I sincerely believe you can make this soup into whatever your heart desires! I used unsweetened almond milk which made it creamy without adding a funky flavor. Since I had to hand chop the cauliflower I blended half the pot in my vita-mix and it came out to a perfect creaminess. Thanks so much for the recipe–you really made me feel healthy at a point I was scraping at the surface of death. Oh I am so glad, thank you for the wonderful feedback! Delicious! I added a little bit of heavy whipping cream at the end! I just finished making this & I have to say that it is fantastic! I used already riced cauliflower from Trader Joe’s & just added the spices & roasted it that way & it worked perfectly. I also left out the carrots to keep it a bit lower in carbs, but I think it needs the sweetness from them (so I added a bit of 0 carb sweetener to make up for it). Thanks for a delicious & healthy meal! Omg…delicious. It’s my new favorite soup. Oh wonderful! Thanks for letting us know Bonnie. This is such an attracting blog and nice recipe. I will try doing this quinoa tomorrow. Thanks for sharing. Thank you, that means a lot. Let me know how it turns out! Great idea! I love the prepared rice. So easy! Thanks for feedback Laura. Hate kale, hate soups with ‘bits’ in them, not vegan, not even vegetarian but this soup is great!! Made a few times now.